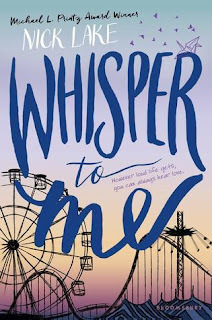 Review: I thought this book would be a light-hearted YA/NA romance and was pleasantly surprised to find it was a much more serious story. A serial killer is loose on the Jersey Shore-when Cassie finds a severed foot on the beach, she starts to hear a voice. The voice tells her to hurt herself, engage in OCD type behaviors (like excessive cleaning) and restricts her (does not permit her to speak to others, will not allow her to read, etc). While Cassie attempts to deal with her mental illness, she befriends a girl named Paris (who has a myriad of her own issues), and she embarks on a relationship of sorts with an unnamed boy who rents the apartment over her father's garage. There were many things I loved about this book. Probably my favorite thing was the format-the entire book is an email from Cassie to Mr. Brown (he is unnamed in the book but entering Brown in the fall..thus I will refer to him as Mr. Brown). There are no chapters and I think it flows nicely. I was also intrigued by Cassie's treatment and relationship with her father. I think the biggest issue with this book is the relationship between Cassie and Mr. Brown. I would never call them boyfriend/girlfriend and they definitely were not in love by any stretch of the imagination. Most of their interactions were quite awkward and they kissed a few times. They do embark on an investigation of sorts but it didn't last too long. I felt his reaction to their 'breakup' (if you can call it that) was completely over the top given their few interactions with each other. Overall-the 'love' aspect of this book was lacking but I did enjoy this. Looking forward to more by this author.